You must have been wondering how to make money blogging from Home to the extent that you don't know any other idea to think of rather than blogging. Blogging is one of the easiest ways to make money from home. Some people feel like blogging is a fast of time while others think that blogging is a waste of energy, but the truth is that many have sponsored themselves in school and become a graduate today, through blogging. many have built houses today, through blogging while many are driving latest cars today through the money they made from blogging. Yet they are still blogging, therefore why won't you make money blogging? You can do it, you just have to figure out a way to do it. Stop looking down on yourself maybe by saying that you are too small to make money from blogging. You can make money blogging even as a teenager, your age doesn't matter when it comes to blogging. So let's dig it now and begin. Before it's too late. Blogging is sweet if you know what blogging is all about. 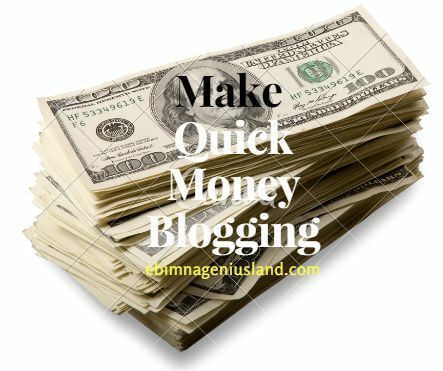 making money through blogging is another benefit and coolest way to make it in life and also maintain a wealthy life without any stress or sweat outside looking for who to buy what you are selling. Now, let's do it. let's teach you how to do it because we know that you can do it. it's right there inside of you. The zeal to do is there, so let's begin in teaching you how to make money blogging. When you want to become a full blogger with no omission if anything to lose, you just have to put money at the back of your mind, the reason is that when you make money the first thing to think of in blogging, you might end up not becoming a blogger at all. When your contents are original and more creative than others people's own, it makes your viewers never want to stop visiting your site every day. More especially when you use more understandable English. No matter how many people that have written the post before you, you must have to make yours look very special and sound as if it never existed. Therefore writing original posts and publishing main contents are one of the boosters to making money in blogging easily. Selling books on your blog is another way to make money so quick in your blog, but you must make sure that if you are selling an e-book on your blog, it must be originally electronized. Don't use selling of fake e-books to attract an audience to your blog, because the moment the notice it's fake, they'll spread the news about your blog as fake, and every other thing you sell in your blogs becomes fake to them. Beware! Never you forget that people like sharing fake news, more than that of the original. When you have some physical products to sell in your blog at a cheaper rate it helps your readers to be more interested to keep checking out in your blog as often as every day to know the latest cheap product in your site every day. Sometimes, you can just sell some of your personal products which you know are real and never un-original, especially when you sell them cheaply. Sometimes, you need to do some giveaways on your blog in order to get more audience to your site. You might be asking me what give away means? It simply means giving something away freely from your pause to your audience or readers. You can as well apply for Google Ad-sense, it's also a perfect place to make and earn money to your blog.